Lovina is a quiet coastal town on the North Bali coastline west of the city of Singaraja. Lovina is a relatively new name coined in the 1950s by the late king of Buleleng (Buleleng Regency) Anak Agung Panji Tisna, with a good eye for future tourism-based development. It started with small lodge built on his own land and named Lovina. After going through struggle of ups and downs, finally the community accepted the presence of Lovina. Nowadays the name Lovina is used for the stretch of seven traditional villages, which all slightly merge into one over ten kilometersof the main road which hugs the north coast to the west of Singaraja: Temukus, Kalibukbuk, Anturan, Pemaron, Tukad Mungga, Banyualit and Kaliasem. Kalibukuk is the main hub of this area and is often thought of "Lovina town centre". If traveling along the main coast road from Singaraja, you turn towards the Lovina coast at the only set of traffic lights on the entire north road. Impressive Balinese gates frame the entrances to the two roads where most of the restaurants and hotels are. Western style minimarts and ATMs are located on the busy main road. Lovina offers very reasonably priced accommodation from no star home stays to about three star resorts with pools. Posh private villas are tucked away all along the coast too. Food is cheaper than Ubud or the south coast by about a third. The whole stretch of coastline in the north is fringed by quite narrow black sand beaches, which are accessed by a multitude of small lanes which run perpendicular to the east-west coast road. The beaches are generally safe for swimming, and the waters of Bali's north coast, in direct contrast to the crashing surf of the south, are relatively calm. From a distance, the water does not look too clean due to the colour of the sand but it is in fact almost always crystal clear. The locals do make an attempt to clear away plastic flotsam too. Diving, snorkelling fishing dolphin watching, diving on coral reefs are the main activities, but perhaps above all else, this is an area in which to relax and take in a very slow, traditional pace of life. Lovina is ideal for family groups with young children or older adventurers who want to kick back and quickly become part of the community. It can get a little crowded in July and August, but outside that peak season, this is a quiet part of the island. Lovina also has a large number of tourist stalls which are limited to the area of beach between the dolphin statue and the main restaurant road. The stall holders are not as aggresive as those in other parts of Bali. Open air bars often provide loud, live music in which patrons can participate and it's not unusual to see foreigners jamming with locals. Many foreigners have made this locality home and the place gets busy at sundown when both locals and foreigners come down to the beach for 'happy hour' and a good meal. There is a nightly game of beach volleyball happening in the car park in front of the main bars too. Perama  offers transportation from major tourist destinations in Bali and has a local Lovina office in Anturan. Perama shuttle buses to Lovina leave from Kuta, Sanur, Ubud, Candidasa and Padang Bai. They use mini buses without air-conditioning, the price from Kuta, Sanur and Ubud, as of November 2014, is Rp 140,000. While this is more than twice more than using bemos (and not much more comfortable), you will avoid changing bemos (generally, twice) in Denpasar and the need to bargain with bemo drivers who enjoy to overcharge visitors. For a group of three or four, however, taxi or private car will cost same or cheaper, while much more comfortable. If travelling from other locations along the coastal road, such as Tumbalen in the East or from Gilimanuk (the Java ferry port) in the west, local buses are available. Just flag them down on the road and ask to be dropped in Lovina, if you want an area other than Kalibukbuk, let the conductor know where. A single journey between towns on this road should be up to only 50k RP. Tourist scam (November 2014): when using these shuttle buses the driver will sometimes drop you off a bit out of town. There will be several people waiting for you. It will look like you're in the middle of nowhere, but just walk a bit further till you hit the town center. The people waiting for you are working for guesthouses and dive centers. Don't listen to them, walk ahead. Look around what the town has to offer and compare guesthouses/diving centers etc. Long distance bemos are a bit of challenge for all but the most experienced of budget traveller, but you can get to Lovina from most major towns in Bali, almost always via Singaraja. Rattletrap old busses ply the road between Singaraja and Gillimanuk along the north coast, connecting many of the beaches and towns including Lovina and Pemuteran. Just hail them from the side of the main road and haggle over the fare if you are a foreigner. Public Bus form Gillimanuk to Lovina costs for local 30,000IDR, but for bule it is 50,000IDR, if you bargain you can pay price for local. If coming from East Bali, at any point north of Amlapura (by Tirta Gangga) you can flag down the dark red bemos heading to Singaraja. From Singaraja Banyuasri terminal take another bemo (40k) or an ojek (15-20k). For directions from further south, see the Padang Bai page. 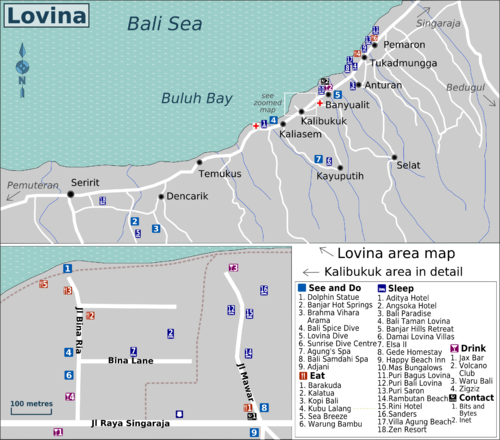 Most visitors arrive in Lovina from the south in a self-drive hire car or with a car and driver. A journey from Kuta takes about 3 hrs and from Sanur slightly less. Ubud is a 2 hour car journey over the central highland range. Many visitors from the south choose though to break their journey at Bedugul or Kintamani. A pre-paid coupon taxi direct from the airport will cost you Rp 450,000 and takes about 3 hours. This is a good area for walking as the roads are relatively quiet and the beaches long and easily passable. Renting a bicycle is popular and again, easy to find. Many hotels have their own. You should be aware though that away from the coast road, there are a lot of steep hills. The easiest way to visit the surroundings of Lovina is by renting a motorbike. There are many roadside outlets and expect to pay between Rp 50,000-90,000 per day. (Caveat emptor: carefully read any agreement you sign and never surrender your passport in exchange for a rental. Sovina Shop on Jalan Mawar/Rambutan is not recommended due to substandard motos and an owner desperate to find imaginary fault with returning rentals. Take your own pictures to document the moto condition ahead of time.) The roads are quite good here and nothing like as crowded as in south Bali. Local bemos ply the north coast road between Singaraja and West Bali, stopping at all points on the Lovina stretch. You will need some patience and they can be very crowded indeed. As there is only one main road it is though hard to get lost. The small road that runs down to the beach-front from the main east-west coast route at Kalibukuk is called Jalan Bina Ria. Turn to the coast just past the only set of traffic lights on the north road. At the beach end of this road is a rather wonderful dolphin statue (complete with slightly horrific one-jawed rusting dolphins). 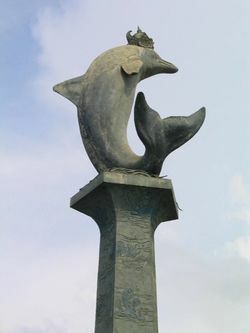 Apart from being a notable piece of kitsch, this is a reminder of the reason for the initial drive beind tourist development at Lovina (dolphins, obviously). Mini wooden and stone replicas of this statue are for sale widely in the area. Your hotel can (and will offer repeatedly to) arrange day tours to the nearby sights including the beautiful highland scenery of Bedugul or Munduk to the south, the beaches of Pemuteran to the west, and the city of Singaraja to the east. All are within easy reach. You can arrange a half day trip to the Les village waterfall, bat cave and coral protection project, which is around 40 km to the East. You will be offered dolphin sighting trips every other minute. These leave the main beaches each morning at dawn, and have mixed reviews as the boats tend to outnumber the dolphins. It can still be an enjoyable ride, and if you do find a lot of dolphins it is of course very worthwhile. The price is fixed by the local boatmen's association, and is currently Rp 100,000 per person, allthough you occassionally find a boatman who might give you a better price. The boats are numbered by this organization for easy recognition. Two boats are especially good choices: 'Beautiful Fish' is a speedboat, which dolphins tend to like and to play in the waves it creates (250.000 Rp). Popeye (boat number 1, since the drivers' father set up the organization) provides very good trips. 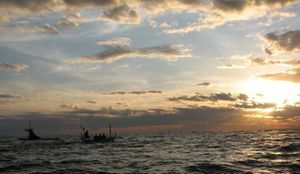 At dawn, there are at least twenty boats looking for dolphins and when found, chasing them like a hide-and-seek for adults. Some boat drivers look around for an own group of dolphins, averting from the 'crowds'. The Popeye boat takes his time and waits patiently until it can follow the dolphins gently for as long as possible (100.000 Rp). Canyoning is praticable in this area, this fun adventure sport will make you jump, slide, abseil waterfall and discover virgin nature of Bali. Cockfights are popular around around Lovina, perhaps more so than anywhere else in Bali. At the fights, huge sums of money change hands as illegal gambling on the outcome is rife. Needless to say this is an unnecessarily cruel and horrible activity. There are several dive operators based out of Lovina that operate daily dive and snorkeling trips to Menjangan Island, Tulamben and Amed, as well as dives from the local beaches. Be sensible and careful as some hotels and counters try to sell unlicensed diving trips that may look official on paper. 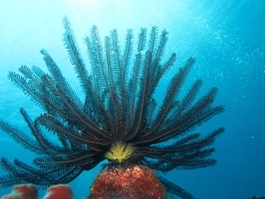 Do not pay before you have seen the dive centre, and check that you will dive with certified divemasters/instructors. Lovina as whole Bali has become a famous destination for a practice of the Yoga and there are a few yoga classes and instructors. 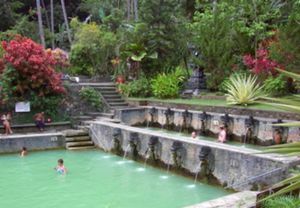 Lovina has several spa facilities. Whilst more low key than the spas in south Bali, the service is excellent and the prices are much lower than at the opulent spas in the south. Also, do not under-rate or overlook the traditional massage women who work on the beaches at Lovina. Most of these women come from families where massage skills have been passed down through many generations, and they really know what they are doing. A beach massage will also cost you less. Kalibukuk has a number of shops both on the main coast road and on Jalan Bina Ria selling the usual selection of Bali goods. You will find everything from arts and crafts to T-shirts at prices very marginally higher than you would pay in south Bali. A Lovina speciality though are dolphin statues, usually carved from wood (don't believe those trying to convince they are from ebony!). This is due to the strong association of Lovina with dolphins, and if you want to take home just one souvenir from Lovina, then this is the most appropriate. 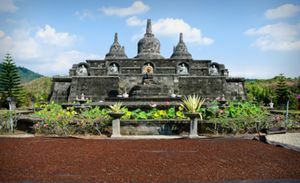 There is a huge amount of budget and mid-range accommodation in Lovina and many visitors turn up without reservations. Options at the higher end are more limited but this is changing. Puri Manik Sari Hotel, address: Gang binaria, Kalibukbuk. In front of Elsa 2 and Angsoka. Prices starting at Rp 120,000. Rooms are available with hot water and AC, cold water and fan and hot water with fan. All the rooms/bungalows are located in a lovely Balinese garden with Mango trees, a little fish pond and coconut trees. Tours can be booked at the reception. Restaurants, bars and all other tourist attractions are within walking distance. Visitors to Lovina are often offered magic mushrooms. Although the Indonesian legal position on mushrooms is unclear and they are commonly available around the island, this is very much at your own risk and frankly, best avoided. The telephone area code for Lovina is 0362. Free WiFi (of varying speeds) is now available in most restaurants, cafes and hotels. Mitsuya Cafe has very slow internet. It is just east of Malibu Dive on Jalan Raya Singaraja. Restaurants, cafes, bars and convenient stores are now offering free WiFi if you patronise their venues. From Lovina you can continue your Bali trip westwards to Pemuteran and West Bali National Park for more diving, trekking and birdwatching, then perhaps onwards to Gilimanuk and Java. Pemuteran is the closest starting point to the West Bali National Park island of Menjangan, and there is a wide range of accomodation in Pemuteran itself. Gilimanuk has some very basic hotels but nowhere with wifi, and almost nothing to do; if heading to Java, better to cross with the ferry (40 mins) then find a homestay in Ketapang (there are a couple just 2 minute walk from the ferry terminal, locals can point the way) if wanting to break the journey. The old administrative capital of Bali at Singaraja is just 20 minutes to the east. Bedugul for lakes, mountains and the botanical gardens.